Elgar’s final and arguably his finest distillation of creative energy came on the eve of the 1920s as The Great War reached an uncertain end. For it was the years 1918 and 1919 that saw the emergence of three moving chamber works and the elegiac cello concerto. In his early twenties Elgar had already attempted to compose chamber music; but those tentative forays proved less than satisfactory. Part of a youthful quartet ended up in transcribed form among Vesper Voluntaries for organ (1891). A string quartet (Op 8) and violin sonata (Op 9) of 1878 were both destroyed, while quartet sketches from 1905 and 1907 have similarly failed to survive. During the second decade of the twentieth century Elgar’s major works had been theatrical in nature, among them The Starlight Express (1915), The Sanguine Fan and Fringes of the Fleet (both 1917). The polarity of his chamber works is obvious. Writing during Elgar’s lifetime, biographer Basil Maine regarded all three mature chamber compositions as a reaction to the preceding period: ‘It is as if, after the excessively emotional response to immediate events, the artist in him demanded a balancing of accounts and called in chamber music with its more temperate and reflective style to adjust the temporary disorder.’ In earlier years Elgar built a reputation with more widely popular choral and orchestral music, works which also produced more handsome returns. But now he adopted a leaner, more interrogatory style and the music has an added contemplative dimension. Percy Young believes the chamber works ‘represent facets of the composer that had hitherto been hidden … the overall tautness of effect and economy, amounting almost to austerity, was … and is … startling’. In 1917 the composer turned sixty. He was increasingly disturbed by the wholesale slaughter of young men on Europe’s savage battle fronts. His own health and mood were suffering and the prevailing atmosphere of jingoism filled him with dismay. After an operation for infected tonsils in March 1918, Elgar endured a painful convalescence and confided in his friend the essayist and art professor Sidney Colvin: ‘I cannot do any real work with the awful shadow over us.’ In all likelihood this was as much a comment on his personal condition as reference to the war itself. At the time, conditions for further significant work were clearly unpropitious. This hiatus proved the lull before a final flurry of inspired, if somewhat conservative work. The catalyst appears to have been his temporary departure from London. In 1917, while close to Fittleworth, West Sussex, Alice Elgar and their daughter Carice discovered Brinkwells, a thatched cottage with oaken beams set amid tranquil woodlands. Here was a welcome haven and it provided an isolation the composer had often sought. It became the family’s summer cottage until 1921. From this vantage point one could look out to the South Downs, and Elgar loved it. He took long walks, chopped wood, built bonfires and enjoyed the solitude. At Brinkwells his health improved and for a time inspiration appeared dramatically rekindled. Elgar also wrote to German-born friend and musical hostess Marie Joshua. She had been especially supportive during his recent illness and was asked to accept dedication of the newly completed work. ‘It is full of golden sounds and I like it’, he commented, ‘but you must not expect anything violently chromatic or cubist.’ Mrs Joshua’s obvious delight was short-lived. She died suddenly on 10 September, five weeks before Op 82 was heard in full. On 28 September Elgar informed Colvin that the Sonata was complete. Adrian Boult, a pupil of Nikisch, had just made his conducting debut and with typical enterprise he sought permission to present Elgar’s newest work before a gathering of the infant British Music Society. Instead, its first performance came at the composer’s London home, Severn House, Hampstead, on 15 October. Reed and pianist Anthony Bernard were the performers. The Reed/Bernard duo finally introduced the sonata at a BMS meeting on 13 March 1919 and the first ‘open’ presentation came a week later, on 21 March, this time with Reed and Sir Landon Ronald in the Aeolian Hall. At the outset Elgar surprises us, adopting a foreign key, A minor, rather than E minor, a stratagem he upholds to within a bar of the movement’s end. His tempo marking is Allegro and the movement begins with a vaulting risoluto theme leading to a descending phrase in characteristic tripping (trochaic) rhythm at the ninth bar. Young detects a distant parallel between the second subjects of both this movement and the Romance (Op 1). In any event Elgar reaches his poetic subject via a section derived from inverting the opening statement. Thereupon the movement follows customary sonata lines (comparisons with Brahms readily spring to mind) before its stormy conclusion. The second, more inward movement is titled Romance and prompted Young to conclude: ‘This is a personal utterance, owing to no one and, for that matter, influencing no one.’ It proceeds in 3/4 time and begins without sharps or flats, borrowing and reshaping Elgar’s descending motif from the Allegro. There now follows a freer, more gentle B flat major theme heard first on the violin and reiterated by the piano. Close to Brinkwells stood a skeletal clump of trees at one time struck by lightning and resultingly gaunt, twisted and foreboding. Elgar was fascinated by the legend that these were the arrested forms of Spanish monks stricken for wanton and unspecified acts of a capricious nature. As a consequence much is made of the trees as a programmatic component in the chamber music, notably in this Romance. After an expressive climax the Romance subsides with a reference to its opening, concluding in A major. The solemn finale begins in E major and its broad opening theme shows Elgar’s inclination towards unaccented sequence. Again there is a more animated motif and as the two contrasted themes are counterbalanced a final nod in the direction of the Romance is heard. Final impetus comes in the short-lived coda bringing the Sonata to an emphatic conclusion. The movement was introduced at Severn House on 7 January, though Newman, the quintet’s dedicatee, was not present. Nor did he attend when the completed work was heard in Hampstead two months later (7 March). The first assessment came in a letter from one of the guests present, Mr Bernard Shaw: ‘The quintet knocked me over at once’, he observed. ‘This was the finest thing of its kind since Coriolan—there was the same quality—the same vein.’ Shaw promptly qualified these glowing remarks, noting: ‘You cannot begin a movement (first movement) in such a magical way and then suddenly lapse into the expected.’ On 3 May both the quartet and quintet were heard, this time at Bray, near Maidenhead, home and venue of host Frank Schuster and his sister Adela. Pianist William Murdoch joined violinists Albert Sammons and Reed, violist Raymond Jeremy and Felix Salmond. The premiere of these two important works was at Wigmore Hall on 21 May 1919. A mood of dark intensity informs the unequivocal opening measures of the spacious quintet. The impression is rather like that of plainchant. Resonances of conflict are sounded and these surface more fully in the final movement. It was this eerie aura of premonition that gave rise to Shaw’s remarks (above), though Percy Young’s judgement is less double edged. He ranks this ‘in some ways Elgar’s single greatest movement’, citing Johnson’s appreciation of greatness in King Lear. Soon after Elgar’s opening, the piano octaves and restless string disturbances are lost among the lower strings and a new chromatic string theme is introduced, permitting the twin ideas to shed light on one another within the Moderato. The following Allegro proceeds via a rhythmic ‘sing-song’ motif with strings in octaves and the piano providing a simple harmonic cradle. 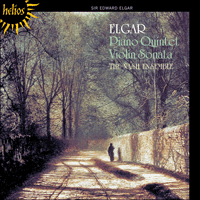 Maine notes that here Elgar works in subject groups as in the symphonies. ‘In its composition and design’, he adds, ‘the Quintet is traversing ground between Elgar’s symphonic and his chamber music styles.’ A further emotional dimension arises with chromatic thirds, a second subject in ‘Spanish’ mode from the violins. The recapitulation brings a compelling, urgent summation with the troubled mood remaining operative. The noble Adagio is in E major and 3/4 time. It begins in tranquil mood with a viola solo, cooperative unperturbed strings and politely decorative piano counterpoint. A related, more contentious idea follows, which breaks up the rhythm. With the development of this material the key is modified and the emotional temperature raised. Equilibrium is eventually restored and the two themes assume a new closeness as the movement fades to silence. Similarities with Brahms’s clarinet quintet are frequently and logically drawn. Both preface their finales with an introduction and here Elgar lends cohesion to the work as a whole, integrating the second ‘arpeggio’ theme of the first movement and the second subject of the Adagio. The proceedings have an aura of improvisation. Parrott detects an unadventurous streak in Elgar’s work at Brinkwells: ‘Gone are the brash, brassy modernisms. He is content to play about with formal differences.’ Indeed, these are contemplative works. The grandeur is no more. Gone is the old triumphalism. In their place we hear a more intimate, private ‘voice’ and with it the distilled vision of a richly creative, uniquely English artist. Son ultime—et peut-être sa plus belle—distillation d’énergie créatrice, Elgar la vit sourdre à l’orée des années 1920, alors que la Grande Guerre connaissait une issue incertaine. Ce fut en effet dans les années 1918 et 1919 qu’émergèrent ses trois émouvantes œuvres de chambre et son élégiaque concerto pour violoncelle. À vingt ans un peu passés, Elgar s’était déjà frotté à la musique de chambre, mais ces incursions expérimentales s’étaient avérées tout sauf satisfaisantes: une partie d’un quatuor de jeunesse finit ainsi transcrite dans les Vesper Voluntaries pour orgue (1891); un quatuor à cordes (op. 8) et une sonate pour violon (op. 9) de 1878 furent détruits; quant aux quatuors esquissés de 1905 à 1907, ils ne survécurent pas. En 1917, le compositeur dépassa le cap de la soixantaine et fut de plus en plus perturbé par les massacres en masse perpétrés sur les féroces fronts européens. Sa santé, son humeur en pâtirent, l’atmosphère cocardière de l’époque le consternant au plus haut point. Opéré suite à une infection des amygdales, en mars 1918, il endura une convalescence douloureuse et confia à son ami Sidney Colvin, essayiste et professeur d’arts plastiques: «Je ne peux faire aucune œuvre digne de ce nom avec l’atroce ombre qui plane au-dessus de nous.»—une phrase qui, vraisemblablement, visait autant son état personnel que la guerre en elle-même, les circonstances étant, à l’évidence, tout sauf propices à l’écriture d’une pièce importante. Cette pause allait être le calme avant un ultime accès d’œuvres inspirées, quoiqu’un peu conservatrices, dont le catalyseur semble avoir été un éloignement temporaire de Londres. En 1917, alors qu’elles se trouvaient près de Fittleworth (West Sussex), Alice et Carice, l’épouse et la fille du compositeur, découvrirent Brinkwells, une chaumière aux poutres en chêne nichée au creux de bois paisibles. Ce havre bienvenu, qui offrait à Elgar l’isolement si souvent désiré, fut, jusqu’en 1921, le cottage d’été familial. La maison donnait sur les South Downs, qu’Elgar adorait. Il partait dans de longues promenades, coupait du bois, faisait des feux de joie et goûtait la solitude. À Brinkwells, sa santé s’améliora et, pendant un moment, son inspiration connut un regain spectaculaire. Elgar écrivit aussi à Marie Joshua, son amie allemande et hôtesse musicienne qui l’avait particulièrement soutenu pendant sa récente maladie—il lui demanda d’ailleurs de bien vouloir accepter la dédicace de la sonate nouvellement achevée. «Elle regorge de sonorités dorées et je l’aime bien», commenta-t-il, «mais ne vous attendez à rien de violemment chromatique ou cubiste». Le plaisir manifeste de Mrs Joshua fut de courte durée: elle mourut subitement, le 10 septembre, cinq semaines avant que l’op. 82 fût joué en entier. Le 28 septembre, Elgar informa Colvin de l’achèvement de la Sonate. Adrian Boult, un élève de Nikisch, venait de faire ses débuts de chef d’orchestre et, avec l’audace qui le caractérisait, il demanda l’autorisation de présenter la toute nouvelle œuvre d’Elgar à une réunion de la British Music Society naissante. Ce furent cependant Reed et le pianiste Anthony Bernard qui la créèrent le 15 octobre, à Londres, chez Elgar (Severn House, Hampstead), avant de la jouer lors d’une assemblée de la BMS le 13 mars 1919; la première présentation «publique» survint une semaine plus tard (21 mars) à l’Aeolian Hall avec, cette fois, Reed et Sir Landon Ronald. Au début, Elgar nous surprend en adoptant une tonalité étrangère à l’harmonie (la mineur au lieu de mi mineur), un stratagème qu’il conserve à une mesure de la fin du mouvement. Ce dernier, marqué Allegro, s’ouvre sur un outrecuidant thème risoluto menant à une phrase descendante (neuvième mesure), au caractéristique rythme sautillant, trochaïque. Young décèle un lointain parallèle entre les deuxièmes sujets de ce mouvement et de la Romance (op. 1). Quoi qu’il en soit, Elgar atteint son sujet poétique par le biais d’une section dérivée de l’inversion de l’énonciation initiale. Après quoi le mouvement suit les lignes de sonate habituelles (des comparaisons avec Brahms nous viennent spontanément à l’esprit) avant une tempétueuse conclusion. Le deuxième mouvement, plus intime, s’intitule Romance et amena Young à conclure: «Voilà une énonciation personnelle, qui ne doit rien à personne et qui, d’ailleurs, n’influence personne.» Il évolue dans une mesure à 3/4 et s’ouvre sans dièses ni bémols, en refaçonnant le motif descendant de l’Allegro. S’ensuit un thème en si bémol majeur plus libre, adouci, joué au violon et réitéré au piano. Près de Brinkwells se dressait un squelettique bouquet d’arbres frappés par la foudre, dépouillés, déjetés et sinistres. Elgar fut fasciné par une légende invérifiée selon laquelle ces silhouettes figées étaient celles de moines espagnols foudroyés pour avoir commis des actes licencieux non spécifiés, d’une nature changeante. Voilà pourquoi il fit des arbres une composante programmatique de sa musique de chambre, notamment de cette Romance. Passé un apogée expressif, cette dernière s’efface dans une référence à l’ouverture pour s’achever en la majeur. Le solennel finale commence en mi majeur, son ample thème initial attestant le penchant d’Elgar pour la séquence non accentuée. On retrouve un motif plus animé et, alors que les deux thèmes contrastés sont contrebalancés, un ultime signe s’élève en direction de la Romance. L’élan final survient dans l’éphémère coda, qui amène la Sonate à une conclusion vigoureuse. Le mouvement fut présenté à Severn House le 7 janvier, en l’absence, toutefois, du dédicataire de l’œuvre, Newman—deux mois plus tard, à Hampstead (7 mars), ce dernier n’assista pas non plus à la création du quintette achevé. La première réaction nous vient d’un autre invité, Mr Bernard Shaw, dans une de ses lettres: «Le quintette me sidéra … C’était la plus belle chose du genre depuis Coriolan—la même qualité, la même veine.» Mais Shaw tempère bien vite son éloge: «Vous ne pouvez commencer un mouvement (le premier) d’une manière aussi magique et puis sombrer, soudain, dans le prévisible.» Le 3 mai, le quatuor et le quintette furent joués, cette fois à Bray, près de Maidenhead, chez Frank Schuster et sa sœur Adela. Le pianiste William Murdoch se joignit aux violonistes Albert Sammons et Reed, à l’altiste Raymond Jeremy et à Felix Salmond. Ces deux œuvres capitales furent créées au Wigmore Hall, le 21 mai 1919. Une sombre intensité baigne les premières mesures, sans équivoque, du spacieux quintette, qui laisse plutôt une impression de plain-chant. Les résonances de conflit sont sondées et émergent plus complètement dans le mouvement final. Ce fut cet inquiétant climat de prémonition qui inspira à Shaw ses remarques (cf. supra), mais le jugement de Percy Young est moins à double tranchant. Il y voit «à certains égards, le seul plus grand mouvement d’Elgar», paraphrasant les propos de Johnson sur la grandeur dans Le roi Lear. Peu après l’ouverture, les octaves pianistiques et les incessantes perturbations aux cordes se perdent dans les cordes inférieures; un nouveau thème chromatique survient aux cordes, permettant aux idées jumelles de s’éclairer mutuellement dans le Moderato. L’Allegro suivant évolue par le biais d’un motif rythmique «chantant», avec les cordes en octaves et le piano qui tisse un simple berceau harmonique. Maine souligne qu’ici, Elgar travaille par groupes thématiques, comme dans les symphonies. «Dans sa composition, dans son plan», ajoute-t-il, «le Quintette parcourt un territoire stylistique qui va de la symphonie à la musique de chambre elgariennes.» Une nouvelle dimension émotionnelle apparaît avec les tierces chromatiques, un second sujet sur le mode «espagnol», aux violons. La réexposition véhicule un récapitulatif insistant, irrésistible, où le climat troublé ne se dissipe pas. Le noble Adagio, en mi majeur et à 3/4, s’ouvre sereinement sur un alto solo, avec des cordes coopératives, impassibles, et un contrepoint pianistique poliment décoratif. S’ensuit une idée connexe, plus chicanière, qui casse le rythme. Le développement de ce matériau induit une modification de la tonalité et une élévation de la température émotionnelle. L’équilibre est finalement restauré et les deux thèmes assument une intimité nouvelle alors que le mouvement s’évanouit dans le silence. On évoque souvent, et logiquement, des similitudes entre ce quintette et celui avec clarinette de Brahms. Chacun voit en effet son finale précédé d’une introduction; dans la sienne, Elgar intègre le deuxième thème «arpeggio» du premier mouvement et le deuxième sujet de l’Adagio, conférant une cohérence à son quintette. Les choses se déroulent dans un climat d’improvisation. Parrott décèle une veine conventionnelle dans les compositions elgariennes de Brinkwells: «Disparus les impétueux, les impertinents modernismes. Il se contente de jouer avec les différences formelles.» De fait, ces œuvres sont contemplatives. La grandeur n’est plus, le vieux triomphalisme a vécu; à leur place s’élève une «voix» davantage intime, privée et, avec elle, la vision distillée d’un artiste remarquablement créatif, singulièrement anglais. Elgars letzte und sicherlich feinste Bündelung seiner kreativen Energie erfolgte vor Anbruch der 1920er Jahre, also zu einer Zeit kurz vor und nach dem unsicheren Ende des ersten Weltkrieges. 1918 und 1919 entstanden nämlich drei bewegende Kammermusikwerke und das elegische Violoncellokonzert. Schon in seinen frühen zwanziger Jahren hatte Elgar versucht, Kammermusik zu komponieren, aber diese zaghaften Vorstöße waren alles andere als zufrieden stellend. Teil eines jugendlichen Quartetts fand in bearbeiteter Form Eingang in die Vesper Voluntaries (1891). Ein Streichquartett (op. 8) und eine Violinsonate (op. 9) von 1878 wurden beide vernichtet. Auch die Skizzen für ein Quartett von 1905 und 1907 sind abhanden gekommen. Im zweiten Jahrzehnt des 20. Jahrhunderts waren Elgars wichtigste Kompositionen für die Bühne gedacht, wie zum Beispiel The Starlight Express (1915), The Sanguine Fan und Fringe of the Fleet (beide 1917). Elgars Kammermusik stellte dazu einen deutlichen Gegensatz dar. Der zu Elgars Lebzeiten schreibende Biograph Basil Maine hielt alle drei Kammermusikwerke aus den späten Jahren für eine Reaktion auf die vorangegangene Periode: „Man bekommt den Eindruck, als ob der Künstler in ihm nach der äußerst emotionalen Reaktion auf die unmittelbar zuvor erlebten Ereignisse einen Ausgleich forderte und sich der Kammermusik mit ihrer gemäßigteren und stärker reflektierenden Art zuwandte, um der zeitweiligen Verwirrung Herr zu werden.“ In den Jahren davor hatte sich Elgar einen Ruf mit Werken aus den publikumswirksameren Chor- und Orchestermusikgenren aufgebaut, die auch bessere Erträge abwarfen. Jetzt bediente sich Elgar aber eines schlankeren, hinterfragenderen Stils, und die Musik wurde um eine kontemplative Dimension erweitert. Percy Young glaubt, die Kammermusikwerke würden „Facetten des Komponisten widerspiegeln, die bisher verdeckt waren… Die durchgängig enge Beziehung zwischen Ökonomie und der fast als herb zu bezeichnenden Wirkung war … und ist … verblüffend“. 1917 wurde der Komponist 60 Jahre alt. Er war zunehmend schockiert über die massenhafte Abschlachtung junger Männer auf den wüsten europäischen Kampfplätzen. Elgars eigene Gesundheit und Stimmung litten, und der vorherrschende Chauvinismus erfüllte ihn mit Horror. Nach einer Operation im März 1918, bei der man die entzündeten Mandeln entfernte, erholte sich Elgar nur schwerfällig, und er vertraute sich seinem Freund, dem Essayisten und Kunstprofessor Sidney Colvin, an: „Ich kann mit diesem schrecklichen Schatten über uns nicht richtig arbeiten.“ Aller Wahrscheinlichkeit nach bezog sich diese Bemerkung sowohl auf seine eigene persönliche Situation als auch auf den Krieg. Zu jener Zeit waren die Bedingungen für weitere bedeutende Werke eindeutig ungünstig. Diese Unterbrechung erwies sich als die Ruhe vor dem letzten Sturm kreativer, wenn auch etwas konservativer Werke. Der Katalysator war anscheinend Elgars zeitweilige Abwesenheit von London. 1917 entdeckten Alice Elgar und ihre Tochter Carice während eines Aufenthaltes in der Nähe von Fittleworth, West Sussex, ein inmitten eines ruhigen Waldstreifens gelegenes, strohgedecktes, mit Eichenbalken versehenes, kleines Haus namens Brinkwells. Hier bot sich ein willkommener Zufluchtsort, das Haus ermöglichte die Zurückgezogenheit, die der Komponist so häufig gesucht hatte. Brinkwells diente der Familie bis 1921 als Sommerhaus. Von hier aus konnte man bis zur Bergkette South Downs schauen, und Elgar liebte Brinkwells. Er unternahm lange Wanderungen, hackte Holz, legte Lagerfeuer an und genoss die Einsamkeit. In Brinkwells verbesserte sich seine Gesundheit, und zeitweise schien die Quelle seine Kreativität wieder rege zu sprudeln. Elgar unterhielt auch einen Briefwechsel mit seiner in Deutschland geborenen Freundin und Gastgeberin musikalischer Soireen, Marie Joshua. Sie hatte Elgar in seiner letzten Krankheitsphase besonders unterstützt und wurde nun gebeten, die Widmung des kürzlich abgeschlossenen Werkes anzunehmen. „Es ist voller goldener Klänge und ich mag es“, schrieb Elgar, „du darfst aber nichts irrsinnig Chromatisches oder Kubistisches erwarten“. Marie Joshua freute sich über die Widmung offensichtlich sehr, konnte sich aber nicht lange daran erfreuen. Am 10. September verstarb sie plötzlich, fünf Wochen bevor das Werk op. 82 als Ganzes zu hören war. Am 28. September informierte Elgar Colvin über den Abschluss der Sonatenkomposition. Der kurz zuvor erstmals als Dirigent aufgetretene Nikischschüler Adrian Boult bat Elgar mit dem für ihn typischen Unternehmergeist um Erlaubnis, dessen neuestes Werk in einer Versammlung der kürzlich gegründeten British Music Society vorstellen zu dürfen. Die erste Aufführung fand aber im Londoner Haus des Komponisten, Severn House in Hampstead, am 15. Oktober statt. Die Interpreten waren Reed und der Pianist Anthony Bernard. Am 13. März 1919 stellte das Duo Reed-Bernard die Sonate schließlich auch in einer Versammlung der BMS vor, und die erste „öffentliche“ Aufführung erfolgte eine Woche später, am 21. März, in der Aeolian Hall, diesmal durch Reed und Sir Landon Ronald. Zu Beginn überrascht uns Elgar mit der entlegenen Tonart a-Moll anstelle von e-Moll, ein Kunstgriff, an dem er bis zu einem Takt vor Satzende festhält. Die Tempoanweisung für den Satz lautet Allegro, und ein springendes, mit risoluto überschriebenes Thema eröffnet ihn. Darauf folgt im neunten Takt eine absteigende Phrase mit einem typisch hinkenden (trochäischen) Rhythmus. Young erkennt eine ferne Verwandtschaft zwischen dem zweiten Thema sowohl dieses Satzes als auch der Romance (op. 1). Wie dem auch sei, erreicht Elgar sein poetisches Thema über einen Abschnitt, der auf der Umkehrung des Anfangsgedanken beruht. Danach folgt der Satz den üblichen Sonatenvorgaben (Vergleiche mit Brahms drängen sich häufig auf) und kommt zu einem stürmischen Abschluss. Der zweite, stärker nach innen gerichtete Satz trägt den Titel Romance und veranlasste Young zur Schlussfolgerung: „Das ist eine persönliche Äußerung, die weder von einer bestimmten Person angeregt wurde, noch, was das anbetrifft, sich an eine bestimmte Person richtet.“ Der Satz entfaltet sich im 3/4-Takt und beginnt ohne Vorzeichen. Dabei wird Elgars absteigendes Motiv aus dem Allegro übernommen und umgeformt. Darauf folgt ein freieres, sanfteres Hauptthema in B-Dur, das zuerst in der Violine zu hören ist und dann vom Klavier wiederholt wird. In der Nähe von Brinkwells standen vom Blitz getroffene und deshalb kahl, verzerrt und unheimlich aussehende Baumstammreste. Elgar war von einer unbelegten Legende fasziniert, die besagt, jene Baumstämme seien die erstarrten Formen spanischer Mönche. Dieser Zustand sei deren Strafe für Wollust und nicht genauer beschriebene Handlungen kapriziöser Art. Die Bäume bildeten also eine erhebliche programmatische Komponente in Elgars Kammermusik, besonders in dieser Romance. Nach einem leidenschaftlichen Höhepunkt und einer Erinnerung an den Satzanfang klingt die Romance in A-Dur aus. Der feierliche Schlusssatz beginnt in E-Dur, und sein breites Anfangsthema zeigt Elgars Neigung zu fließender Reihung. Wieder gibt es auch ein lebhafteres Motiv, und wenn die beiden kontrastierenden Themen Ausgleich finden, klingt noch einmal die Romance an. Die letzte Aufregung erfolgt in der kurzen Koda, die die Sonate zu einem emphatischen Abschluss bringt. Der Satz wurde erstmals am 7. Januar im Severn House vorgestellt, auch wenn Newman, der Widmungsträger des Quintetts, nicht anwesend war. Er war auch abwesend, als das gesamte Werk zwei Monate später (7. März) in Hampstead erklang. Die erste Einschätzung kam von einem der damals anwesenden Gäste, einem Herrn Bernard Shaw: „Ich war sofort vom Quintett hingerissen“, berichtete er. „Das war das feinste Stück seiner Art seit Coriolan—hier herrschte die gleiche Qualität—die gleiche Stimmung.“ Shaw schränkte diese überschwänglichen Bemerkungen sofort ein und schrieb: „Sie können einen Satz (den ersten Satz) nicht auf so zauberhafte Weise beginnen und dann plötzlich auf Gewohntes zurückgreifen.“ Am 3. Mai erklangen sowohl das Quartett als auch das Quintett, diesmal in Bray in der Nähe von Maidenhead, im Haus des Gastgebers Frank Schuster und seiner Schwester Adela. Der Pianist William Murdoch spielte zusammen mit den Violinisten Albert Sammons und Reed sowie den Bratschisten Raymond Jeremy und Felix Salmond. Die öffentliche Uraufführung dieser beiden bedeutenden Werke erfolgte am 21. Mai 1919 in der Wigmore Hall, London. Eine Stimmung dunkler Intensität beherrscht die unmissverständlichen Eröffnungstakte des großräumigen Quintetts. Sie erinnern stark an einen gregorianischen Choral. Ein Konflikt zeichnet sich ab, der im Schlusssatz stärker ausgetragen wird. Jene gespenstische Aura der Vorahnung veranlasste Shaw zu seiner (obigen) Bemerkung. Percy Youngs Einschätzung ist weniger zweischneidig. Er hält den ersten Satz „in gewisser Hinsicht für Elgars absolut besten Satz“, wobei er sich auf Johnsons’ Wertschätzung der Größe in König Lear beruft. Schon bald nach Elgars Eröffnung verlieren sich die Klavieroktaven und ruhelosen Streichereinwürfe unter den tieferen Streichern, und ein neues chromatisches Streicherthema wird vorgestellt. Hier im Moderato dürfen sich die beiden musikalischen Zwillingsgedanken gegenseitig beleuchten. Das darauf folgende Allegro fährt vermittels eines rhythmischen „Allerweltsmotives“ fort, bei dem die Streicher in Oktaven spielen und das Klavier ein einfaches harmonisches Fundament liefert. Maine stellte fest, dass Elgar hier wie in den Sinfonien in Themengruppen arbeitete. „In seiner Komposition und Gestaltung“, fügte er hinzu, „bewegt sich das Quintett zwischen Elgars sinfonischen und Kammermusikstilen“. Eine weitere emotionale Dimension kommt durch chromatische Terzen hinzu, die in ein zweites, von den Violinen vorgetragenes Thema nach „spanischer“ Fasson integriert sind. Die Reprise führt zu einer zwingenden und hastigen Zusammenfassung, wobei die unruhige Stimmung des Anfangs weiterhin wirksam ist. Das noble Adagio steht in E-Dur und im 3/4-Takt. Es beginnt in einer ausgeglichenen Stimmung mit einem Bratschensolo, kooperativen und gelassenen Streichern und einem höflich umrankenden Kontrapunkt des Klaviers. Ein verwandter, streitsüchtigerer Gedanke folgt, der den Rhythmus belebt. Bei der Durchführung dieses Materials wird die Tonart modifiziert und das emotionale Klima heizt sich auf. Schließlich wird das Gleichgewicht wiederhergestellt, und beim Ausklingen des Satzes erreichen die beiden Themen eine neue Vertrautheit. Analogien zu Brahms’ Klarinettenquintett gibt es häufig und erscheinen logisch. Beide Werke stellen ihrem Schlusssatz eine Einleitung voran. Hier vernetzt Elgar das Werk als Ganzes, indem er das zweite Thema des ersten Satzes („Arpeggiothema“) und das zweite Thema des Adagios miteinander verbindet. Das darauf Folgende zeichnet sich durch eine Aura der Improvisation aus. Parrott weist einen konservativen Zug in Elgars Werken aus Brinkwells nach: „Vorbei ist es mit dem ungestümen, unverschämten Modernismus. Er begnügt sich mit dem Spiel von formalen Unterschieden.“ Diese Werke sind tatsächlich kontemplativer Natur. Die Repräsentationsgebärde ist verschwunden, vorbei ist der alte triumphale Gestus. Stattdessen hört man eine persönlichere, privatere „Stimme“ und mit ihr die destillierte Vision eines ungeheuer kreativen, einzigartig englischen Künstlers.